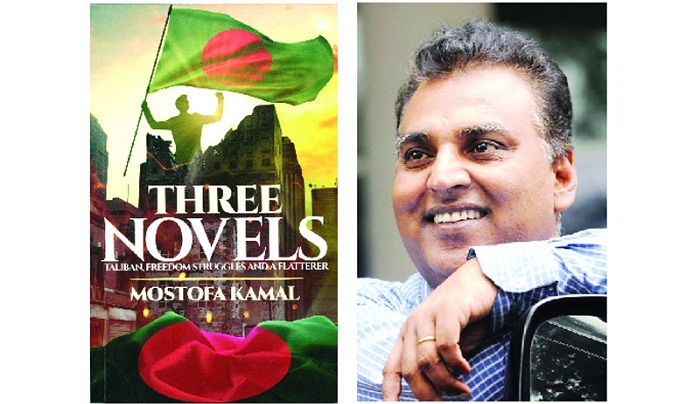 "Three Novels: Taliban, Freedom Struggles and a Flatterer" by popular Bangladeshi author and also a renowned journalist, Mostofa Kamal, has recently been published. The paperback is a collection of the writer's three magnetic Bangla novels--"Taliban, Pak Colonel, and a Young Lady, 'Flaming Eventide', and 'The Flatterer." Notion Press Publishing has published this novel simultaneously from India, Singapore, and Malaysia. Top eBook platforms Amazon, Kobo, and iTunes have already made the eBook format of the 322-page novel available for mobile reading devices. Regarding this, the popular author said: "Readers all over the world are very much interested to know about the Bengali literature. Understanding this matter, the publisher made his mind to publish the English translation of Bangla literary works. Among the Bangalee writers, only Rabindranath Tagore, the most distinguished literary personality of the Bangalee across the globe could attract the readers breaking the boundary. After him, only a few Bangalee writers could draw such attention. So, I think there is no alternative to translation works in order to present our literary works to the global community." His "Taliban, Pak Colonel and a Young Lady" are all about the recent turmoil of Pakistan. In this novel, he has depicted the obvious historical consequences of a country that has indulged in letting fanaticism sprawl wayward. One has to take a longer look at the history of a country to find traces of such things. The horror that was committed in Pakistan, on the 16th of December 2014, is foreshadowed in this novel. The setting of this novel has been appropriately handpicked. The hugger-mugger state of politics in Pakistan has proved detrimental to its populace. This is basically the love story of a Bangladeshi youth, Shakib, and a Beluch lady, Mahaves. This could remind you of Syed Mujtaba Ali's famous novel "Shabnam." Although the initial happenings are the same, this novel is not have a tragic end like "Shabnam." "All others in the army looked at us with utter surprise; perhaps, they were not ready to find us in such a condition. But were they trying to understand our emotion? If they were, we won’t feel so embarrassed. Then she began to walk ahead, and so did I." The second novel "Flaming Eventide" is about the freedom struggles in Bangladesh and their aftermath. It shows how opportunists became powerful and then misruled the country. This is a story of how a freedom-fighter family was made victim by the anti-liberation forces. "Suddenly a few words came out from a loudspeaker. The words pierced the hearts of Humayun Kabir and Manzur Ahmed, ‘We have come out to the street to protest the premature death of Akmal Kabir in police custody. The protest will continue till the misrule ends." The third one "The Flatterer" is a satirical novel. Flattery is an art used by shrewd and less competent people to gain worldly ends. They use it as a ladder to go higher up. They try to satisfy their bosses with words of praise and show excessive modesty that goes beyond usual human behaviour, making it look odd. Yet, this seems to take center stage in office decorum everywhere. "Thank you, Mr. Telwat, let me do my work now. I will call you later. O sorry, I have forgotten to tell you the important matter. You have done a lot for me, I’m sure. Please, do another thing for me. Sure, sir, rightly sir, I will do it. What thing, sir? Manage awards for me. Not national, but international. Anyhow and anyway just manage some. Don’t bother about money. Have you got the point? Sir, sure sir. There will be no problem, sir. I will try, sir. Oh, only try will not suffice; you must make it happen. "Taliban, Pak Colonel and a Young Lady" has been translated by Dulal Al Mansur, the writer himself translated the "Flaming Eventide" while Masum Billah translated "The Flatterer." Born in Barishal, writer Mostofa Kamal started his career as a journalist. He had worked for may well-reputed news organizations since he started his journey as a journalist and kept continuing his passion for literature. We wrote a total of 98 books. Of those, the English translations of Janani, Agnikanya, Agnipurush, Hello Colonel and Jinat Sudori and Mantri Kahini, are set to hit the market soon.